Trimark has delivered energy monitoring, metering and operational control solutions since 2000. Our energy management programs support the U.S. Department of Defense, U.S. Navy, U.S. Marine Corps, municipal and public utilities, and independent power resources. Trimark delivers assembled systems including design, assembly, testing, installation, and commissioning. Systems include metering, data recorders, PV plant controls and secure communications. 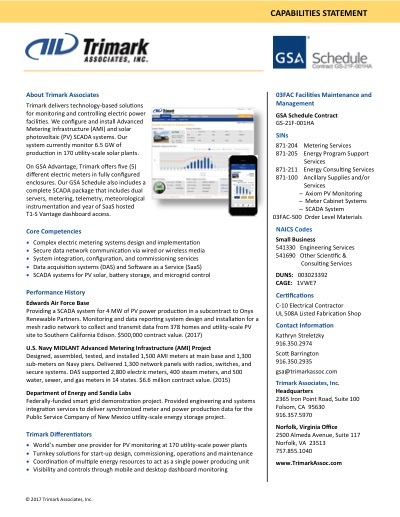 Trimark Associates, Inc., a small business with a GSA contract GS-21F-001HA, provides utility monitoring and control solutions to improve energy management operations. Headquartered in California, we work throughout North America, the Caribbean, and Hawaii. Our systems monitor solar (PV) resources, military bases, utilities and independent power generators. An innovator in renewable energy control systems, Trimark monitors 6.5 GW of power production at 170 utility-scale PV power plants. Installed 1,043 advanced energy meters to track energy usage throughout Northern Virginia, Washington D.C., and Maryland. 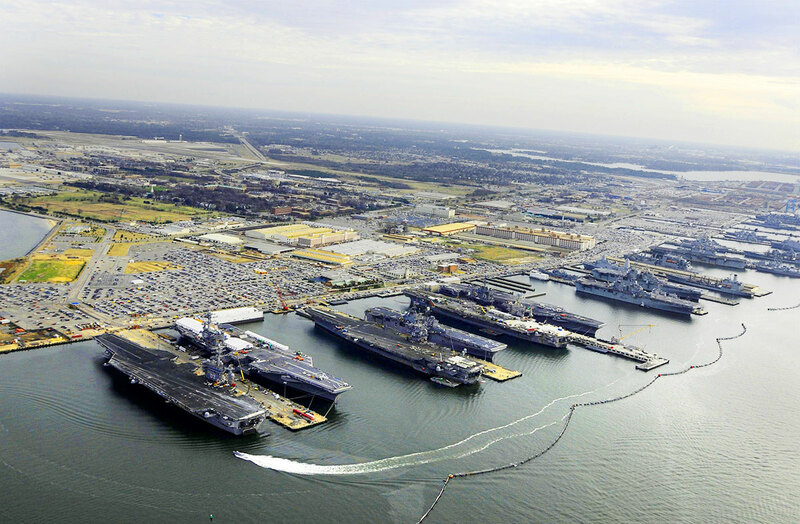 Work involved 14 separate bases including the Washington Navy Yard, National Naval Research Laboratory, National Naval Medical Center, Naval Observatory, US Naval Academy, and US Naval Academy in Annapolis. $3.2 million project value. Provided, installed and configured 477 advanced energy meters at Pearl Harbor, Island, Smith and Hickam AFBs. Project included configuration, testing, validation and commissioning of a data acquisition system which uses a secure communications network to collect data about energy consumption. $1.3 million contract value. 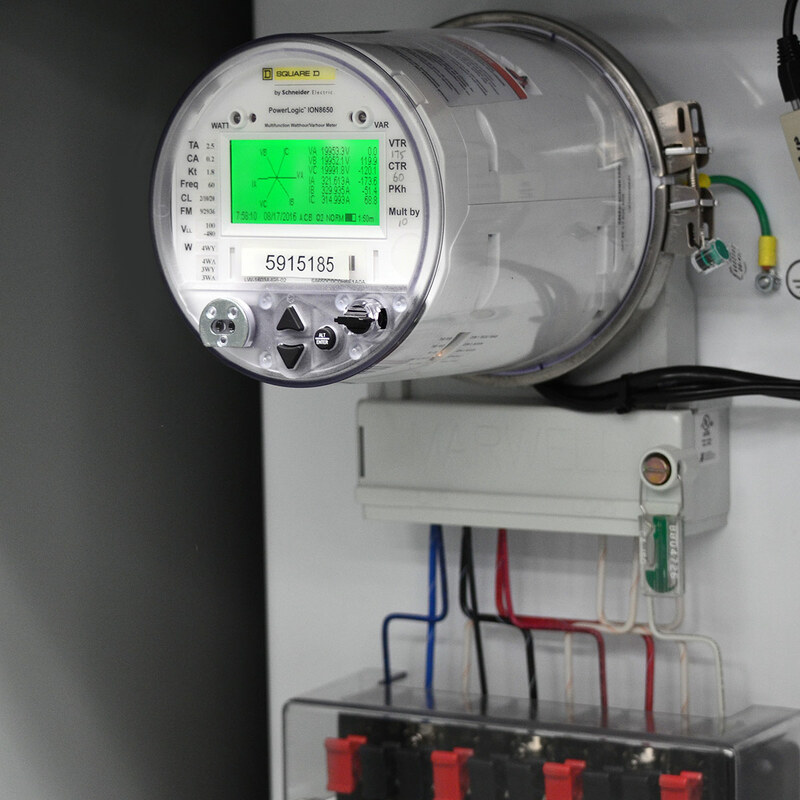 Installed revenue grade meters with AMR devices (data recorder transceivers), wireless data acquisition server and the wiring and conduit between the AMR device and the meter. Water, gas and steam meters were integrated with a cellular-equipped pulse recorder. During commissioning, conducted point-to-point tests to ensure data exchange between the meter, AMR device, wireless data acquisition server and AMR data collection software. Provided, installed and configured 165 advanced energy meters and 65 radios under subcontract at Bolling AFB. $372,000 contract value. Federally-funded smart grid demonstration project. Provided engineering and systems integration services to deliver synchronized meter and power production data for the Public Service Company of New Mexico utility-scale energy storage project. Provided, installed and configured 194 advanced energy meters, 184 water meters, 109 gas meters, 16 radios, and a secure DAS. $276,000 contract value. Call or email to learn more about Trimark’s services offered under our GSA Schedule.